There are wonderful hot springs, but there are also too many guests. So it is little bit hard to enjoy several hot springs. The dinner is so good not perpect. And all staff is very find except one person who speak korean. She is very unkind when i check-in. 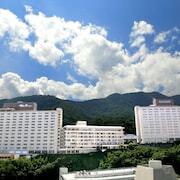 Very near the JR station and the room is spacious, facing the mountain with nice view. However, the food provided in the restaurant is only average. We stayed there 2 nights and ate both breakfast and dinner at the hotel. Suggest to install drinking water facility in the Onsen bath room. We stayed at the spacious sea view room. Room is spacious and nice view. Convenient location. Traditional breakfast served was excellent. Location and seaside view can't be more than better. Ryokan prepares 2 kinds of face washing goods, toner and lotion as well as shampoo, conditioner and body cleanser. Nice and cozy hotel. Meals could be better. Location is great. Hotel staff are very kind and helpful. 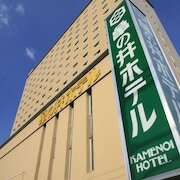 Nice hotel, onsen to room ratio is good. Food is delicious. Family friendly hotel A nice hotel for family with kids. Buffet dinner and breakfast is fair. However the hot spring is kind of too crowded at night. The bed was extremely uncomfortable and the coil spring should have been replaced.